Mr. Mendlovsky is a 71-year-old male who was admitted to The Hamlet Center at Nesconset after 11 days at Northwell Health where he was a patient from August 3rd through August 17th, and underwent a double knee replacement. After being hospitalized, he was admitted to the center to build up his strength. Jan began with physical therapy six times a week daily for four weeks. Patient presented with impairments in balance, mobility, sensation, strength and dexterity, which resulted in limitations and participation restrictions in the areas of self-care, learning, and applying knowledge, social life, economic, and general tasks and demands. Upon admission, Jan needed assistance with personal care and also help with toileting. Jan required major help with transferring and needed the assistance of one or two people, while he walked with the help of one assist. He was able to dress himself until about the halfway point, but still needed assistance. Patient demonstrated excellent rehab potential as evidenced by his ability to follow multi-step directions and was motivated to participate. 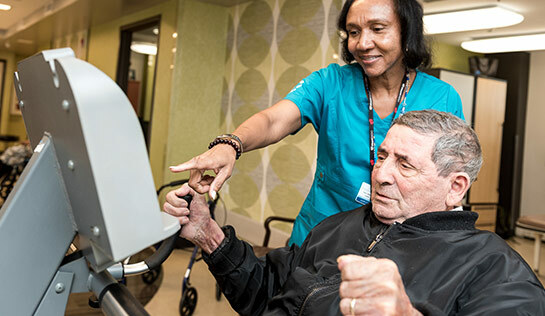 Mr. Mendlovsky made great strides throughout his time in therapy, working closely with his physical and occupational therapists to build strength, stamina, and most of all, motivation. The team complemented his worthiness to succeed and heal. After a little under a month’s stay, Mr. Mendlovsky reached and surpassed his goals, and was cleared for a discharge home with his wife on the 13th of September!